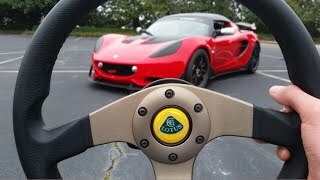 Lotus will take covers off the Elise S Cup R racer at the 2014 Autosport International Car Show in Birmingham on 9th January, alongside big brothers the Exige V6 Cup, Exige Cup R and the mighty Evora GT4. Performance is enhanced thanks to a CFD proved aero pack comprising; front splitter, barge boards, winglets, rear diffuser, floor extensions and rear wing. The model has also been equipped with a tow hooks, a hardtop, a polycarbonate rear window and 16- / 17-inch forged alloy wheels with Yokohama Advan Neova AD07 LTS tires. 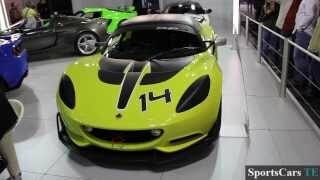 The Elise S Cup R evolves from the road-going Elise S. The car is powered by a mid-mounted, supercharged 1.8-liter 2ZR-FE four-cylinder engine delivering 217 hp (162 Kw) and 250 Nm (181 lb-ft) of torque. 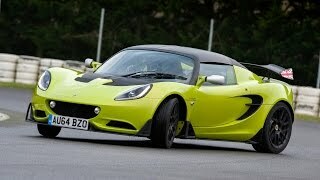 It is connected to a six-speed manual transmission. The engine control module (ECM) has motorsport-specific mapping. 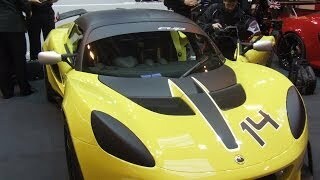 The 2014 Lotus Elise S Cup R will cost £39,125 pounds, or US $62,831. 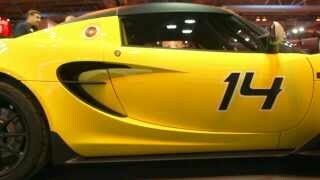 The car won’t be available to drive on the road but will be eligible to compete in the 2014 Lotus Cup racing series.